But picture that too if you want. Hamilton Island was honestly a dream destination. Being the first tropical place I'd ever travelled to, I had extremely high hopes. And boy did the Island live up to them. Think Hawaii meets a private Island aka super tropical & beautiful but also super quiet & relaxing. From the in-pool bar, to the wild golf buggy trips to the secluded bar on top of one of the Island's highest road accessed peaks, this place was honestly a dream come true. My partner & I stayed in the Palm Bungalows. It was initially a toss up between the Reef View Hotel with a view of the ocean or the Bungalows. Being quite private people, we chose the Bungalows. 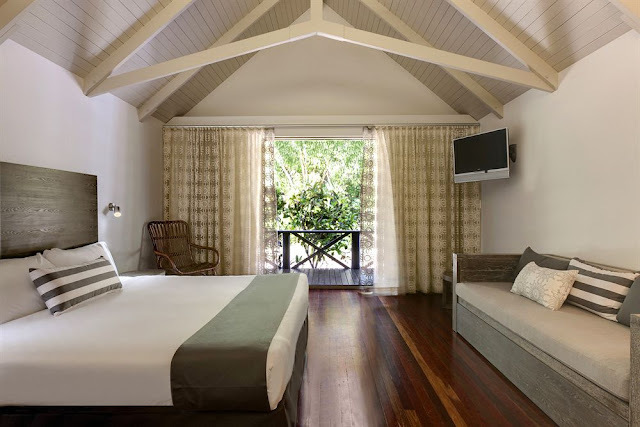 Each Bungalow is open planned with one room holding the bedroom, a kitchenette & a TV & sofa lounge. Then you have built in wardrobes & an ensuite with a shower & separate toilet. You also have your own private deck out the front with a hammock that can be retracted if you plan to come home late & don't feel like tripping over (yes I did learn the hard way). Your room also gets made up every day. You get fresh beach towels & bath towels & they make your bed & clean up any plates or cups in the kitchen. If you book the Bungalows ask for the closest one possible to the hotel. We had Bungalow number 4 which meant we were right next to the hotel putting us in close proximity to the beach & the main activity & shopping centre. Our Bungalow was also conveniently located on ground level so we had easy access to our charging points with the golf buggy we hired. If I had the choice again between the Reef View Hotel & the Palm Bungalows, I would definitely hands down pick the Palm Bungalows. If you're after privacy, peace & tranquility, then this is the way to go. With all Reef View Hotel, Beach Club & Palm Bungalow bookings, you get unlimited access to all water sports that are available for hire. This meant that on our trip we were able to use the 1 & 2 person kayaks, the snorkels, the paddle boards & the windsurfers as many times as we wished and for as long as we wished. There's also 4 different pools that you can pool hop between on the island, all within extremely close proximity of each other. Our package (The Escape to Whitsunday's) also came with a full day trip to the Great Barrier Reef & a half day trip to Whitehaven. 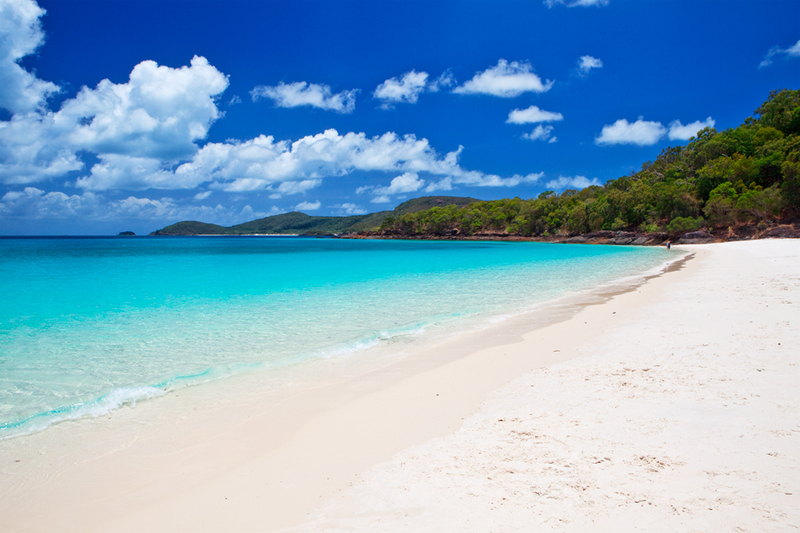 If you travel to Hamilton Island & don't visit either of these places, you are definitely missing out. The Great Barrier Reef snorkel was incredible. Words cannot describe how amazing of an opportunity it was. The underwater life was breathtaking. This snorkel trip was honestly the highlight of our trip. The half day trip to Whitehaven Beach was probably a close 2nd on the highlights list. 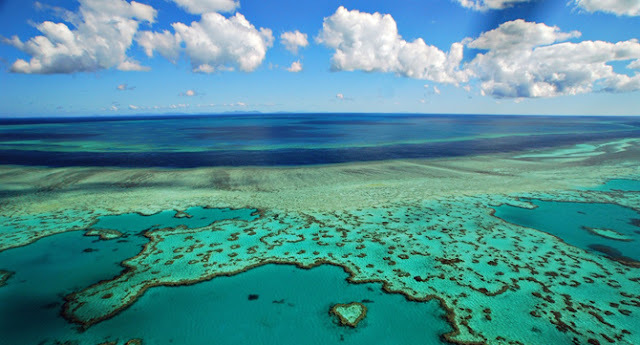 It nearly made it to number 1 however the Barrier Reef trumps any other activity any day of the week. Whitehaven was amazing though. You can't even prepare yourself for how breathtaking it is. We closely followed a family of 5 Stingrays in water so clear it's like you're looking through glass. The sand was whiter then I even imagined. Seriously an amazing place to visit. Besides the in-pool bar there's also another bar spot that you definitely have to visit. With the same name as an extremely popular TV Series, One Tree Hill caught our attention immediately on our first buggy drive. Set up like a little beach shack with a modern twist, One Tree Hill is positioned on one of the highest road accessible peaks on the Island. 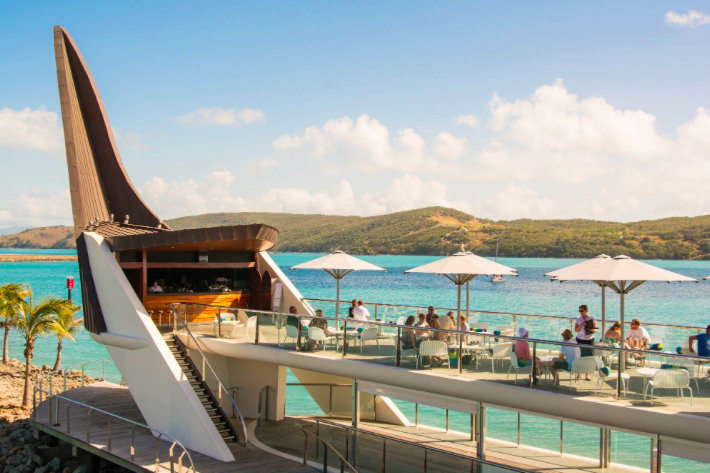 If you're in the mood for some delicious house made cocktails with a view of crystal clear water then One Tree Hill is pit stop you should definitely make. Oh where do I begin. 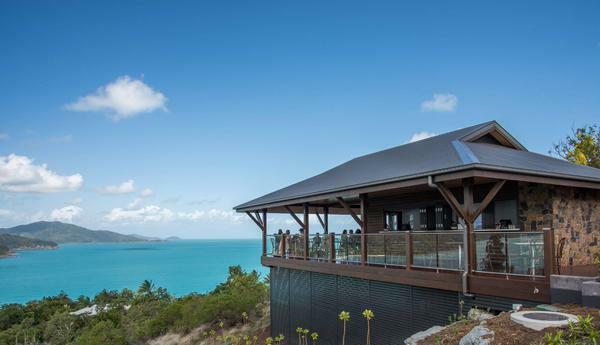 Let me just say that the restaurants on Hamilton Island had the best service I have ever experienced. Ever. Coca Chu was hands down the best restaurant I've ever eaten at in my life. If you love Asian cuisine then you must book in here. Bookings need to be made in advance during peak time as it books up extremely fast. It's worth the wait though. The taste explosion you get from each dish is honestly incredible. If you're looking for convenience then the Reef View Terrace & Sails Club are the go to. Both are positioned in the main centre & overlook their own pools. So if you're down for a meal & then a cheeky midnight swim, head to either. The food is also extremely delicious & filling. Tako was the first restaurant we visited & is a Mexican Restaurant with a modern twist. The meal portions are quite small so if you're feeling hungry, I would suggest not visiting this restaurant. The food was delicious however trying to feed a grown 23 year old man requires a lot more than 2 small tortillas. I do recommend it for a yummy lunch or snack & drink. For a special occasion, Bommie is the place to go. We unfortunately didn't get to visit this fine dining restaurant due to the fact that it was booked out every night however we did have the opportunity to have causal drinks & nibbles on their upper deck which overlooks the ocean & gives you access to the endless starry night skies. 1. If you're travelling after March, I recommend packing an umbrella. We left just as their rainy season was kicking in however when it rains, it seriously rains. 2. Book a golf buggy! For the days that aren't filled up with cruises or snorkelling trips, a golf buggy is seriously a necessity. Travelling around the Island can't really be done comfortably by foot unless you love some good old sweating & heart pumping. 3. Keep your room key on you. If you're a Reef Hotel, Palm Bungalow or Beach Club resident, then everything & anything can be charged to your room. Very dangerous but also very convenient. The Island does have a no key no charge policy, so keep it on you. 4. Don't be scared to book in some activities. I know holidays call for down time but I feel like not trying some of the Island's actives on offer would be a serious loss. We did the speed boat adventure & the Quad Bike tours & absolutely loved them. This was on top of our Great Barrier Reef tour & Whitehaven Tour. They also have Jet Ski Adventures, Sunset Kayaking & Sails & turtle diving adventures. All of my Hamilton Island knowledge packed into one post!